This layout was made with the BEAUTIFUL Bo Bunny Serenade-I Want It All Collection found at fotobella.com. 1. Select BoBunny Serenade Collection. 2. Choose the following paper: Cutouts (Side B), Dragonfly (Side B), Stripe (Side B), Garden (Side B), Poppies. 3. Select the Dragonfly Paper and measure and mark it at 9”x9”. 4. Trim the paper down to 9”x9”. 5. Using the Lucky 8 punch Classic Wreath. Set the cut settings to “on” for the Outer Cut and the Inner Cut. 6. With the red side of the paper facing up, begin punching all four corners. 9. Ink the edges of the shape with black ink. 10. Select the Cutouts Paper Side B and your circle cutter tool. 11. Cut out a circle that is 6” in diameter. 12. Matte your photo in white cardstock, matte with Poppies paper and then matte a third time with Garden Paper Side B. Place the photo on top of the Circle as shown. 13. Select a dark red ribbon and gather three loops together. Use a staple to secure the loops at the base (where my thumb is holding the ribbon). Do not cut the ribbon tails. 14. 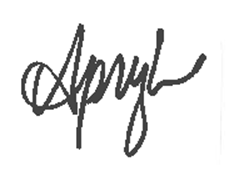 You will want to leave the ribbon long enough to place the Simply Beautiful Sticker on top with two ribbon tails showing on the left of the sticker. 15. Using pop dots, adhere the Simply Beautiful Sticker to the bottom left hand corner of your matted photo. 16. Select a small red and yellow flower, layer and attach with a brad. Using a glue dot, adhere the flower embellishment so that it covers the small red flower to the left of the word “simply” on the sticker. 17. Select the sticker that says “Cherished Memories” from the 12x12 sticker sheet. Using pop dots adhere the sticker to the top right had corner of the matted photo. Select a small black and red flower, layer and secure with a brad. 18. 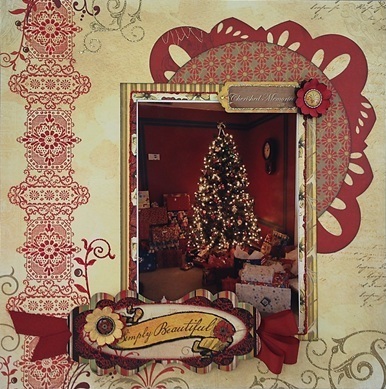 Embellish the layout with Xmas red and gold Stickles. Hope you enjoy this beautiful layout you just made!